■ Six New Units Added! 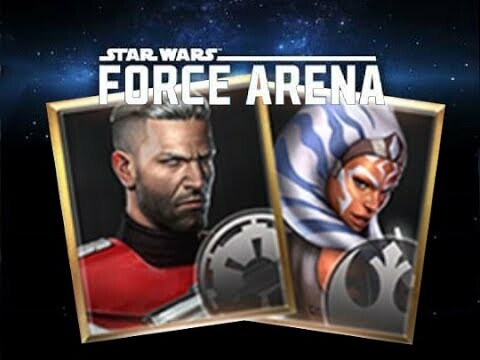 – Ahsoka Tano (Fulcrum) and Rex (Rebel) can be unlocked upon reaching Tier 9 (Chromium) in the Light Side. – B-Wing prototype can be unlocked upon reaching Tier 10 (Aurodium Challenger) in the Light Side. 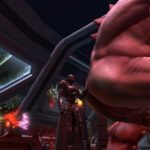 – Gar Saxon and Imperial Super Commandos can be unlocked upon reaching Tier 9 (Chromium) in the Dark Side. – TIE Defender can be unlocked upon reaching Tier 10 (Aurodium Challenger) in the Dark Side. – The details of each new card are based on Level 1. – Details are subject to change. After leaving the Jedi Order and surviving Order 66, Ahsoka Tano decided to fight against the tyranny of the Empire. She hides her identity behind the name Fulcrum and supports the growth of the Rebel Alliance. 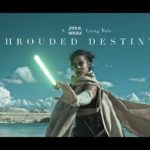 She pursues enemy leaders with incredible speed and two powerful lightsabers. Sweep away the enemy lines and bring despair to the Dark Side with Ahsoka! ▶ Attack enemies at close range using two lightsabers. ▶ Double tap to jump and avoid enemy attacks. ▶ Movement speed greatly increases when approaching enemy Turrets or leaders. 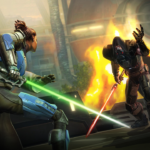 ▶ Use her skill to quickly move towards your enemies and damage them using her dual lightsabers. 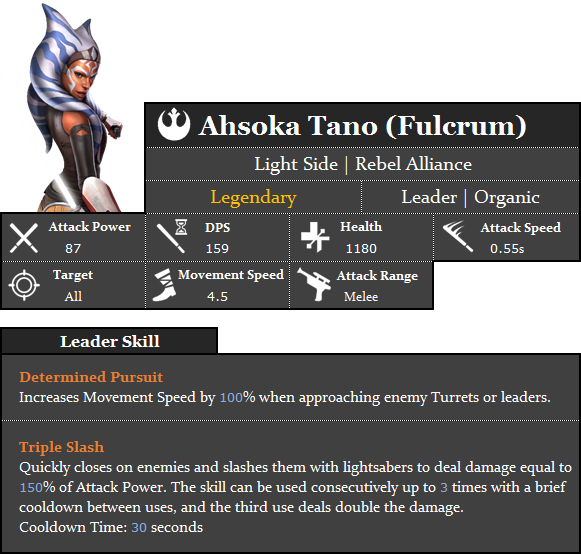 ▶ Ahsoka Tano (Fulcrum)’s skill can be activated 3 times after a certain cooldown period between each use. The 3rd and last hit will deal double damage. 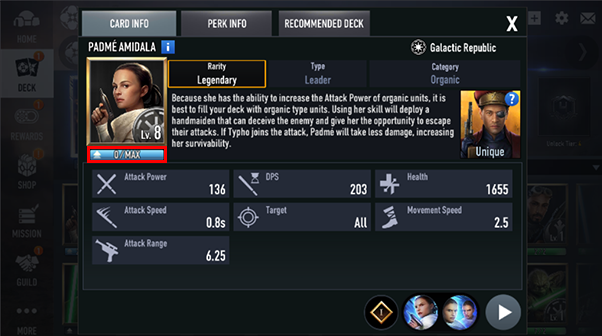 ▶ Ahsoka Tano (Fulcrum) can be unlocked upon reaching Tier 9 (Chromium) in the Light Side. Rex, a legendary commander, has survived numerous battles alongside Anakin and Ahsoka during the Clone Wars. After his retirement, he accompanied Ahsoka, his longtime colleague, and the Ghost crew, carrying out important missions to bring down the Empire. 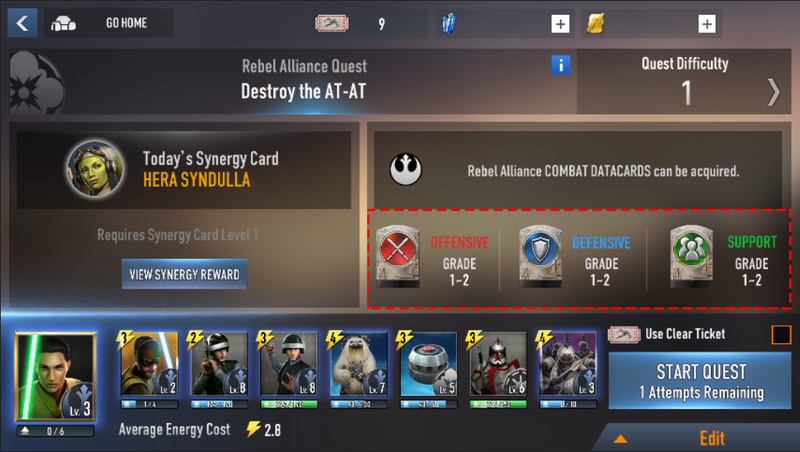 Carry the Light Side to victory with the living legend, Rex (Rebel)! ▶ Attack enemies from a distance using his dual blaster pistols. ▶ Toss a special grenade that can Stun enemy tech units and leaders, or disable structures for a certain period of time. 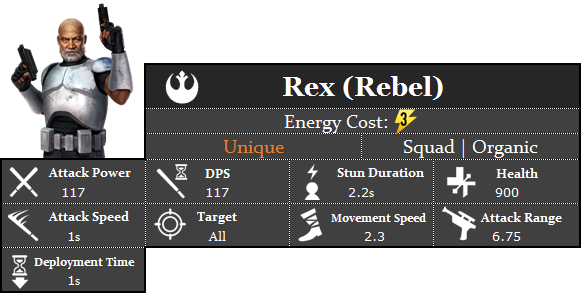 ▶ Rex (Rebel) can be unlocked upon reaching Tier 9 (Chromium) in the Light Side. The unique-looking B-Wing Prototype is different from the traditional Starfighters. It was secretly built on Shantipole and has a special ability as unique as its appearance. It can combine multiple laser beams to create a single, powerful strike. Destroy the Dark Side with a powerful laser attack from the B-Wing Prototype! ▶ Fires a powerful composite laser beam that deals strong damage in a straight line. ▶ B-Wing Prototype can be unlocked upon reaching Tier 10 (Aurodium Challenger) in Light Side. Gar Saxon, the leader of the Imperial Super Commandos, is loyal to the Empire and was appointed as the Viceroy of Mandalore. He proudly wears the Imperial Crest on his shoulder and he is a skilled Mandalorian and is very adept in using blasters and jetpack. 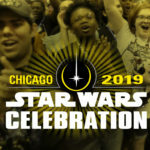 Show the power of the Dark Side with Gar Saxon! ▶ Attack enemies from a distance using a blaster rifle. ▶ Enemies will be unable to attack Gar Saxon when he is airborne. ▶ When Gar Saxon attacks while flying, he focus-fires his blaster rifle to cause serious damage before landing. ▶ Gar Saxon can jump over obstacles. ▶ His skill enables him to launch into the air and fire a mini rocket that deals area of effect damage. ▶ If his skill is used while there are Imperial Super Commandos on the field, both units will launch a combined rocket attack. 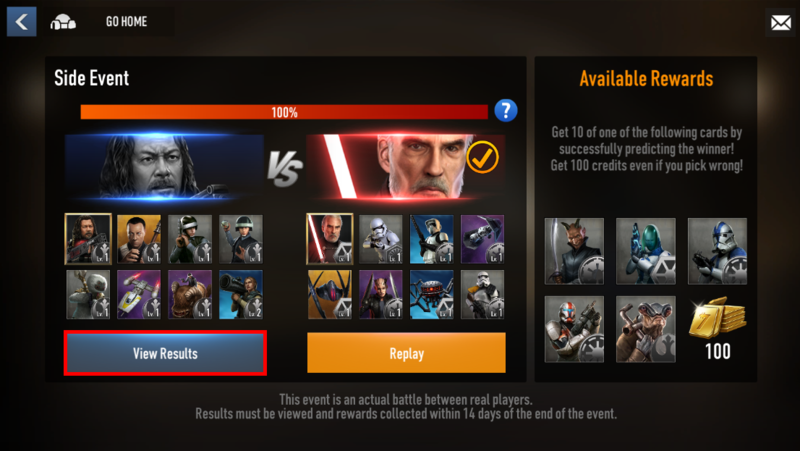 ▶ Gar Saxon can be unlocked upon reaching Tier 9 (Chromium) in the Dark Side. The Imperial Super Commandos who are loyal to Gar Saxon are deadly and cruel. Wearing a unique and sophisticated white Mandalorian armor, they have excellent shooting skills and jetpack mobility. Eliminate the enemies of the Dark Side with the Imperial Super Commandos, the might of the Empire! ▶ When using the Imperial Super Commandos card, two units will be summoned. 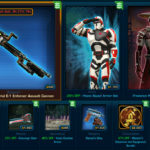 ▶ Attack distant enemies with a blaster rifle. ▶ Can leap over obstacles. 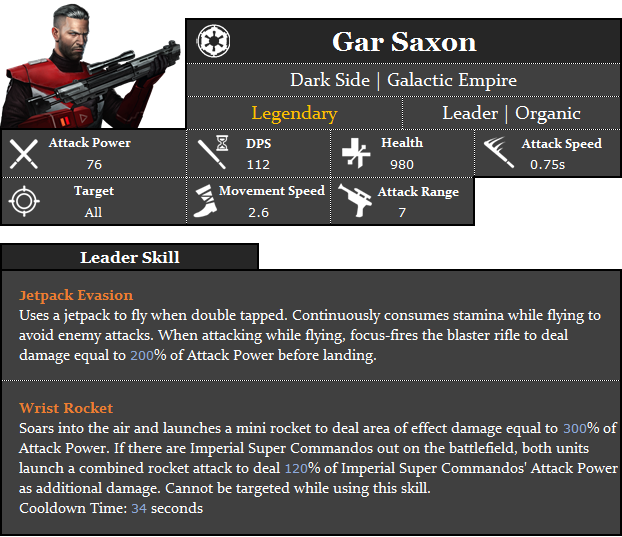 ▶ If Gar Saxon uses his skill, Imperial Super Commandos will fly with him and launch rockets that deal massive area of effect damage. 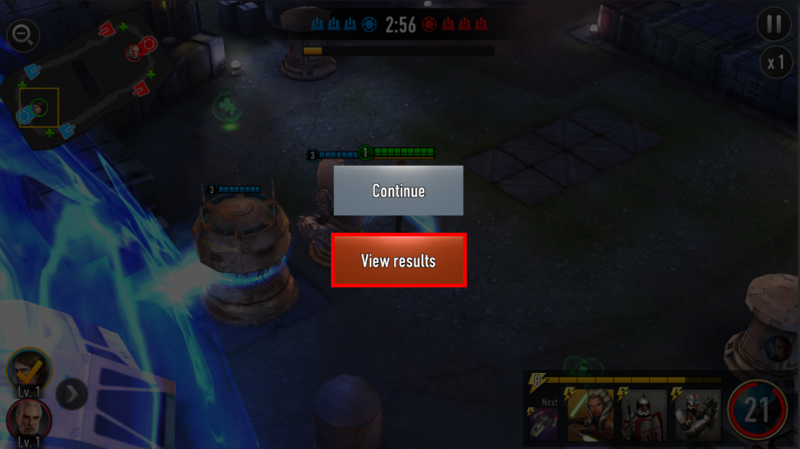 ▶ The Imperial Super Commandos can be unlocked upon reaching Tier 9 (Chromium) in the Dark Side. Secretly developed in Lothal, TIE Defender is the essence of the Empire’s advanced technology. With speed and mobility that no one can match, this aircraft is more advanced than a normal TIE Fighter. Equipped with 6 missiles that can track enemies, even the most powerful of the Light Side can be easily defeated. Bring fear to the enemies with the symbol of the Empire’s superior technology, the TIE Defender! ▶ Fire 6 missiles that target enemies within a certain range and deal intense area of effect damage. ▶ The more enemies in range, the more the missiles will spread. If there is one enemy in range, all missiles will focus on the sole target to deal massive damage. ▶ TIE Defender can be unlocked upon reaching Tier 10 (Aurodium Challenger) in the Dark Side. 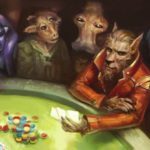 Attack balance and the skills of some cards have been adjusted. The details of each card are based on Level 1. Many Squad Leaders have favored Ezra because of his powerful skill and attacks. However, because the criteria to trigger his ability “Contemplation” is very demanding, it was determined that his battle efficiency is lower than other recently updated leaders. 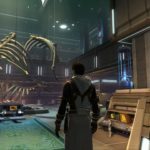 In this update, the conditions for activating “Contemplation” has been improved so that Ezra can participate more actively in combat. ※ Ezra Bridger’s special ability is now proportional to his current HP and will increase up to 27%. ※ When Ezra Bridger dies, the attack speed buff will be removed. If you recover health, the special ability will be applied in proportion to the current HP. The Azumel Spotter has a firing rate that increases as he attacks, making him a powerful unit. However, it was determined that this unit has too much combat efficiency to the point that the overall combat balance was seriously affected. Especially when buffed by Captain Cassian Andor’s special ability, Azumel Spotter could attack a turret outside his range. Thus, it was decided that his attack range would be reduced. The center of Phoenix Squadron, Phoenix One, and Republic Commando are units that have a wide range of attacks and are developed to effectively subdue enemies. However, both units have no special features compared to other ranged troops which were felt especially in situations where they encountered melee troops. In this update, both units will be improved so that they can deal additional damage to nearby enemies. The Imperial Jumptrooper is a unit with the special ability to ignore terrain and avoid attacks from nearby units. However, contrary to the development team’s original intention, its usage seem to be insufficient. 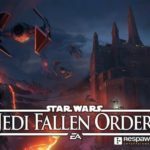 In this update, Imperial Jumptroopers will be improved so that they can be summoned anywhere in the map, regardless of the deployment restrictions. Since the Imperial Jumptrooper’s ability is now very powerful, adjustments have been made to reduce its unit count. A lot of Squad Leaders expressed their opinions regarding the Victory Rewards. We understand the difficulty our Squad Leaders are facing as their rank increases. Since facing tougher opponents will make it more challenging to win, we made improvements to the Victory Rewards. Changed the number of wins needed to acquire all rewards from 17 wins to 9 wins. Rewards were improved. 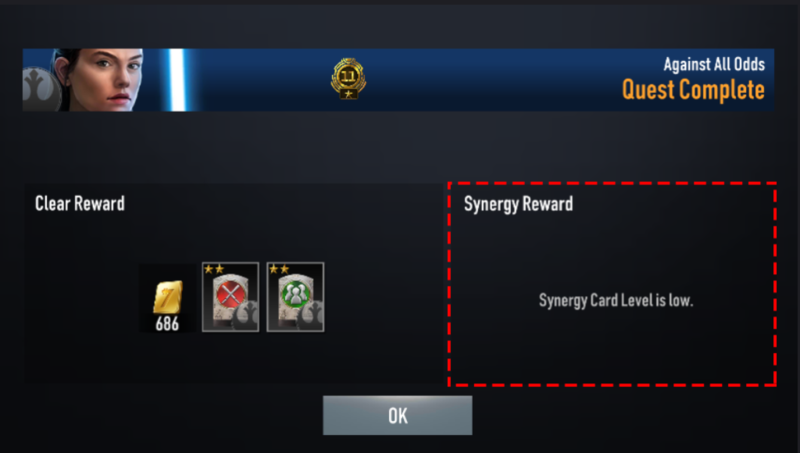 Participation rewards remain identical. The Victory Booster, which enhances the Victory Rewards, was also improved. A significant improvement was made to boost additional rewards from 50% to 100%. With the Victory Booster, more rewards can be earned when you win in Ranked Matches. ※ Squad Leaders who purchased the Victory Booster before the update will have their Booster upgraded during the update. The Booster will be changed to earn 100% when the update is finished. The Datacard Quest that was added in the 3.0 update will be improved for easier use. Made improvements that enable users to open/close the Edit Deck window using a dragging motion. A filtering option has been added to look for desired units faster. The Result screen has been improved to display which condition was not met when the Datacard Quest was cleared without satisfying the Synergy Conditions. 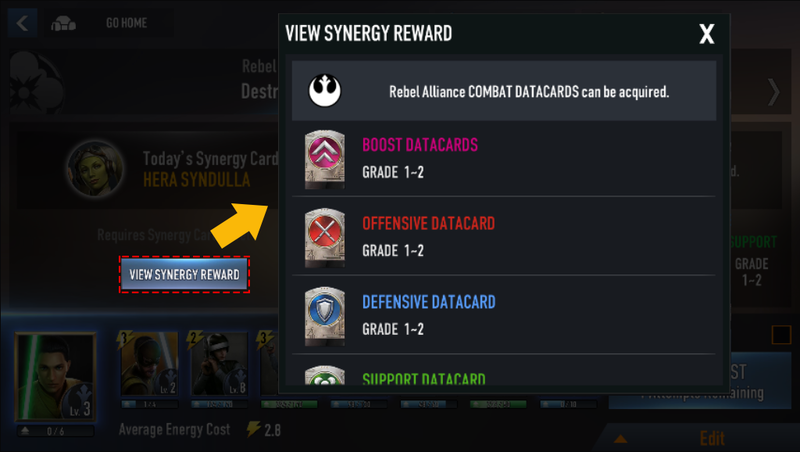 Added a “View Synergy Reward” option so that users can check the Datacards which can be acquired when Synergy Conditions are met. UI improvements have been made so that it is easier to manage Combat Datacards, which are necessary for the Era Set Bonus effect. 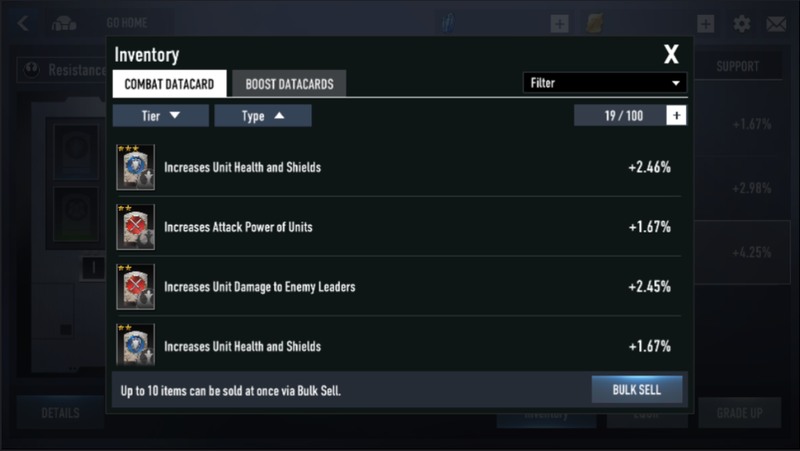 The UI has been improved and the old Era selection button has been changed to a filter for easy bulk selling of Datacards. 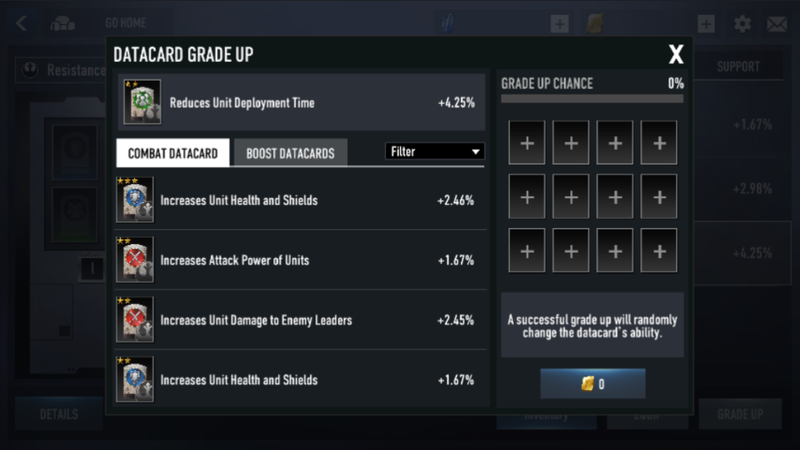 The UI has been improved to easily identify the Datacards that are being used as materials for Grade Up. 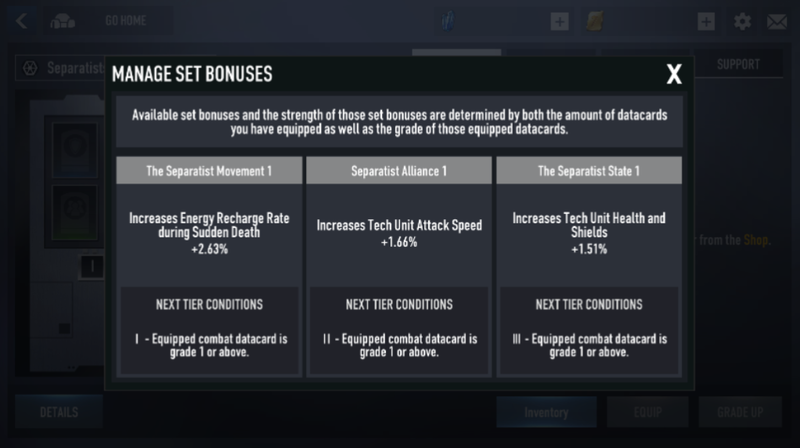 The UI has been improved so that the effects of Set Bonuses can be seen more easily. 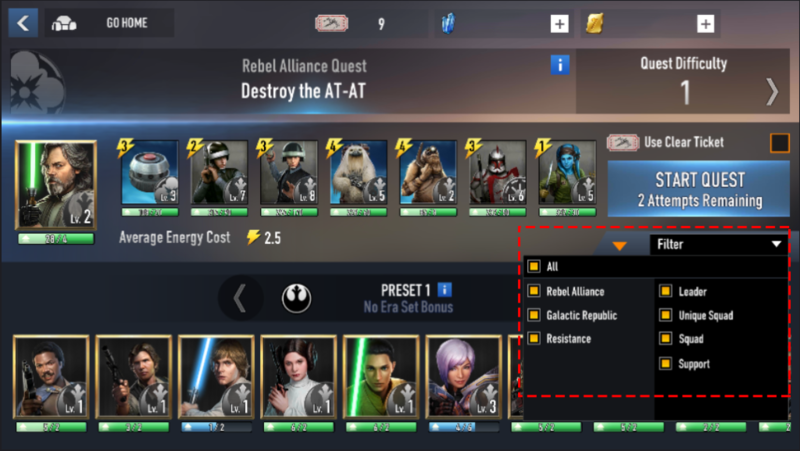 The UI space has been widened so that the ability of Combat Datacards can be easily checked. 2.If there are no Datacards, information on where they can be acquired will be displayed. Improvements, such as sound effects, have been added to make the Perk System easier to use. 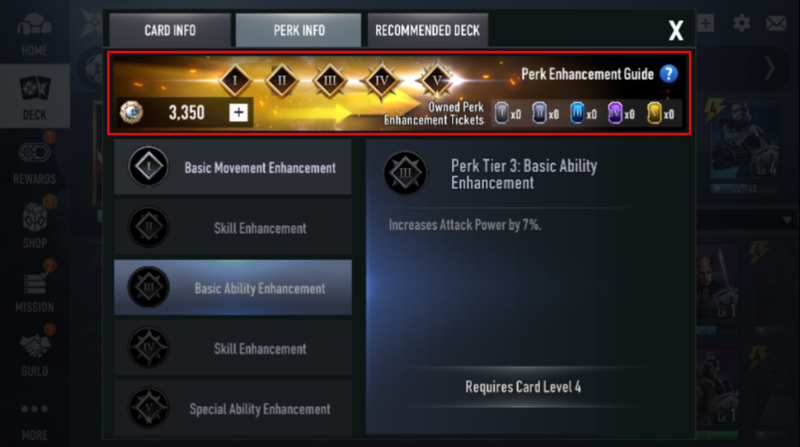 The banner image was changed to match the Perk Enhancement theme. New sound effects will indicate when Perk Enhancement and Card Deconstruction are completed. Some descriptions that had been difficult to read due to their small text size have been made more legible. To avoid confusion, improvements have been made to the settlement time and end of the season notification window. If you are in the top 200, you will now be able to see what rank you are so that you can easily identify what rewards you will earn at the end of the season. If you place 201st or below, changes have been made so that you will see what percentile [%] your rank is. 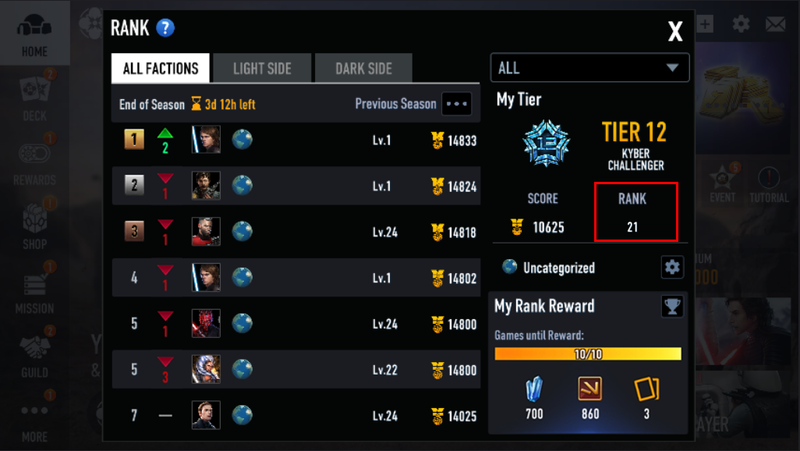 Changed the numbers displayed in the Rank Reward Details window into brackets to visualize the rewards available for the top 200. If the rank is below top 200, it is improved to a clearer description such as “Top 1%”. If you press the Rank button when the season is being settled, a popup window will appear to notify that settlement time is in progress. When there is a tie amongst the top 3 users, the display has been improved so that the information of the players will be shown in sequence. Additionally, you will be informed if there is no 2nd or 3rd place due to a tie. The x4 replay feature is very popular because it is the fastest way to see results. However, a new option has been added to instantly see results so that the x4 function is not needed. The [View Results] option has been added so that Squad Leaders can see the winners amd earn rewards immediately without watching the replay. Additionally, if you accidentally tap the replay button, a [View Results] button is now available so that you can proceed to the results screen immediately. 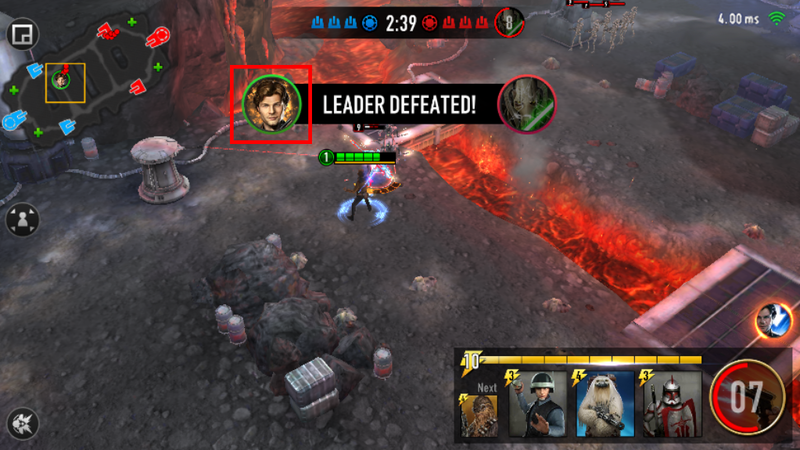 Daily Mission is the most reliable source of Credits and thus a must-have content in Star Wars™: Force Arena. However, it seems that Squad Leaders deserve something more. In addition to the Credit Packs, a Bonus Reward System has been added for more bonuses! 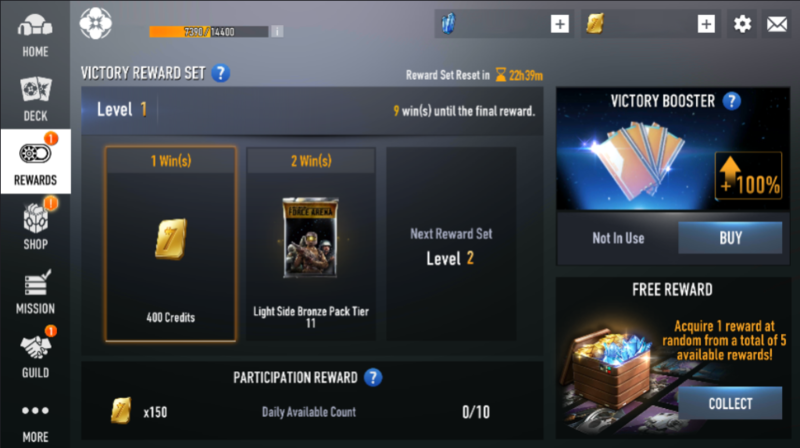 The list of Bonus Rewards and the required number of Credit Packs needed to earn a certain reward. 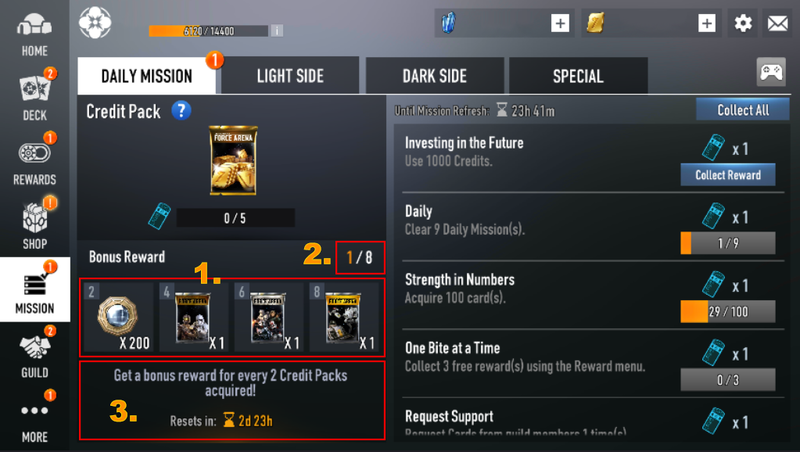 The number of Credits Packs that you’ve earned for the Bonus Rewards. The time remaining before the Bonus Rewards reset. ※ Bonus rewards will be available once you’ve reached the required number of Credit Packs. They can be received by tapping on the appropriate Reward. ※ If you fail to acquire all the available rewards before the Bonus Rewards resets, you will not be able to receive them. 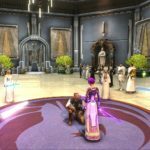 The importance of Credits has increased significantly. Thus, to help out our Squad Leaders, the Daily Credit Supply which provides Credits for each login has been improved. ※ The Daily Credit Supply storage time in the Mailbox will be changed from 7 days to 3 days. – When killing an enemy leader or turret with a leader with a Foil Card, the Foil Card effects will be displayed. 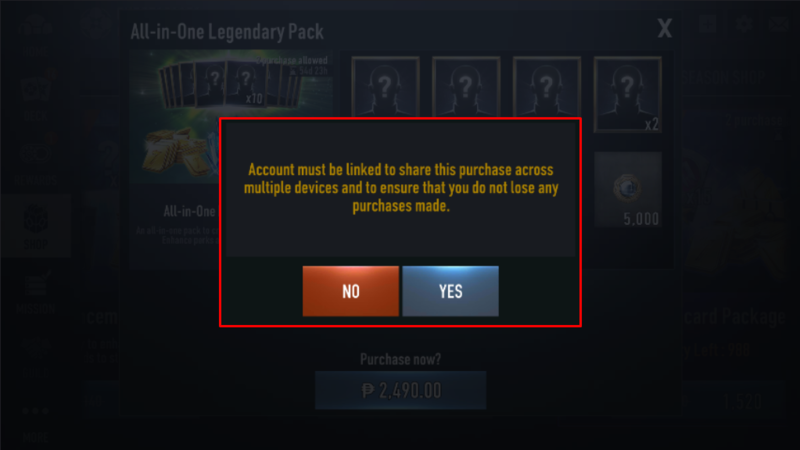 – If you are purchasing a product and your account is not yet linked, a popup window will appear that will guide you through the linking process. Added an Icon where you can check your network status during gameplay. The number of cards that can be acquired from a guaranteed Card Pack will be constant, regardless of the ranking. Improved UI to display names of the items in the Mailbox. Fixed an issue where the Resistance Sniper sometimes stops attacking enemies within range. Fixed an issue where the Datacard “Increases Duration of Units’ Negative Status Effects” figures are abnormally high. AI has been improved so that troops and leaders can quickly detect and respond to enemies in the battlefield. Fixed an issue where various effects are showing up in abnormal positions.